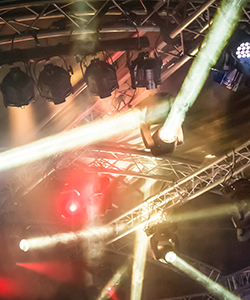 Here at X3 we understand that working with an AV supplier on your event, if you have little or no prior experience within the AV industry, can be a daunting prospect. It’s important to us that you’re not only making the most of your AV budget, but also feel confident when discussing the AV required for your event. That’s why we’ve put together a collection of some of the key and most common AV terms that you are likely to come across. Knowing the basics is a great starting point and busting through the technical jargon will help give you confidence when conversing with the X3 team and conveying your AV needs. Sounds technical, but let’s keep it simple: it is used to describe the width to the height relationship of an image on a screen. The most common aspect ratios used are 4:3 and 16:9. A nice abbreviation for ‘Audience Response System’. We can discuss with you how this works from a hardware and software perspective – if you want to get involved with that level of detail. 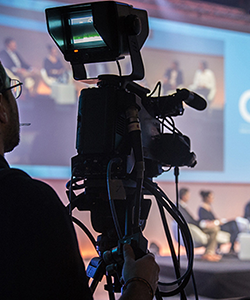 Digital event solutions work well to engage your audience in polls and/or Q&A sessions and are worth considering as an element of your AV, if your event needs this type of audience interaction. Presenting content naturally and confidently is a requirement for all events that have live speakers on stage. 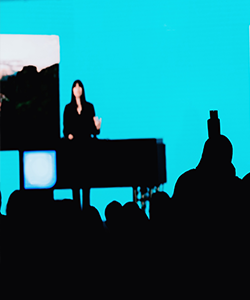 Displaying what content is being shown on the screens behind the presenter, the confidence monitor is placed strategically on stage for speakers to use as a guide. Having this to refer to supports the speaker in delivering their information in sync with the projections of the presentation displayed to the audience. Perhaps a phrase you’ve heard before, but a term that means something different in the AV world. This is the area that your X3 AV team will be allocated to set up and run the AV for your live event. Involving the X3 team from the start of your project will give us the opportunity to visit the venue and for this element to be considered and pinned down early on in the process. A great piece of lighting equipment to personalise your event. How? A gobo holds a template within it to project out your logo or especially created wording. Whatever you choose to place inside the gobo, the design can create a nice impact when customising the event space. The process whereby the set on stage is built ahead of the event and the subsequent actions taken to pull down the set on stage post-event. A microphone is a microphone, right? Well, no there are many variations of microphone to select from. 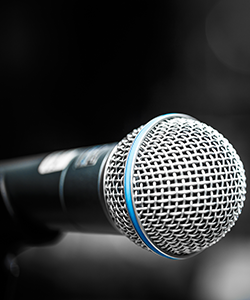 The type of microphone needed will depend on the nature of your event and how the speakers are going to communicate information to attendees; once this has been established we can suggest the best microphone type to suit the speaker’s needs. Using music to introduce speakers or winners to stage can help to create the desired atmosphere within a conference environment. These terms relate to the tunes that will be selected and used for these pivotal points in the event. How do you want to project your content? Rear projection is placed behind the screen, usually at ground level. Whereas front projection is, yep you’ve guessed it, placed in front of the screen. 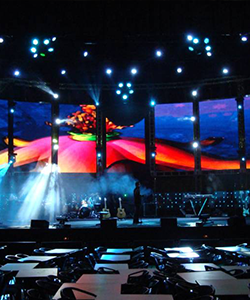 Front projection is usually suspended from rigging to avoid presenters walking in front of it. Due to rigging requirements this type of projection can warrant a larger part of your AV budget; we can discuss your options with you in order to find a solution that suits the needs of your event, whilst keeping within budget. As you may expect, this term relates to the sharpness and clarity of an image on a monitor or screen. Images are made up of pixels; the higher the resolution, the more pixels that can be displayed on the screen – more pixels mean a better quality of image displayed. Are pieces of AV equipment used to hold your selected lighting, speakers and projectors from. Whilst the rigging is the main support frame, trusses are used to hang what is required in place. This is the document that effectively acts as a road-map for the AV of your event. 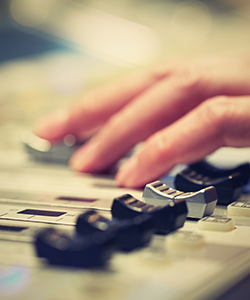 From start to finish, it indicates what audio visual is due to be deployed against pre-determined times. Using a refined show flow plan should ensure that the AV execution during your event is of the highest quality. At this point you may be feeling a little more comfortable with the broader AV lingo you are likely to encounter, but of course there are many other AV terms and phrases that you will be exposed to throughout your AV journey. The X3 Solutions team are always happy to walk-you through your AV quote and to explain any terminology you may not be familiar with, so you know what it ‘actually’ means in basic terms for your event. 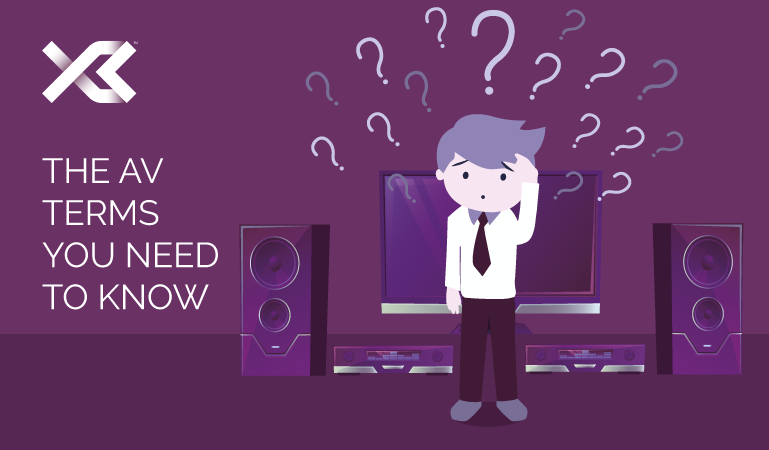 With so much jargon that may baffle you, don’t be afraid to ask our team pertinent questions around your audio visual project; after all, if you don’t ask you’ll never know. X3 Solutions takes a simple and seamless approach to your AV project. We don’t use jargon and instead aim to work with our clients on a collaborative basis; pairing your business expertise with our AV knowledge and experience to produce an event that looks and sounds great and leaves a long-lasting impression. Call +44(0)1252 519303 or send a message to info@x3solutions.co.uk to get started.